By now, 40% of the companies in the S&P 500 index have reported earnings for the fourth quarter, including eight of the top 10 by weight. The S&P 500 companies, accounting for about 80% of market capitalization, are a good sample for what’s going on in corporate America. And what is going on is the first revenue and earnings recession since 2008/2009. 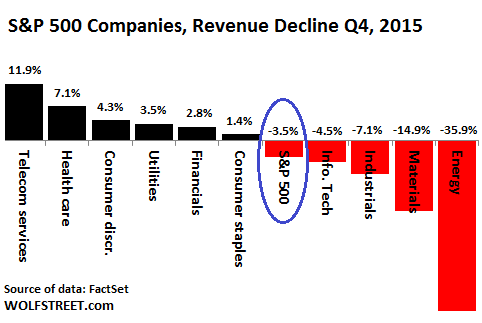 Revenues on a blended basis – actual revenues for companies that have already reported, and estimated revenues for companies that haven’t yet reported – fell 3.5% in Q4 from a year ago, according to FactSet. Revenue declines are stretching across four quarters in a row, a feat that has been accomplished for the last time during the depth of the Financial Crisis: Q4 2008 through Q3 2009. At the company level, AT&T is the largest contributor to revenue growth for the sector. The company reported actual sales of $42.1 billion for Q4 2015 (which reflects the combination of AT&T and DIRECTV), compared to year-ago sales (which reflects standalone AT&T) of $34.4 billion. If AT&T is excluded, the blended growth rate for the sector would fall to 3.1%. A little M&A goes a long way. The Health Care sector always grows. Runaway health-care expenses that consumers and companies have been complaining about for decades are revenues to the industry. It eats up over 17% of GDP. Much of it shows up in “consumer spending.” Given the powerful lobbying by the industry and the absurd dollars involved, no one is going to do anything about the industry’s monopolistic or oligopolistic structures. But the growth of this industry bleeds companies in other sectors and wrings consumers dry. 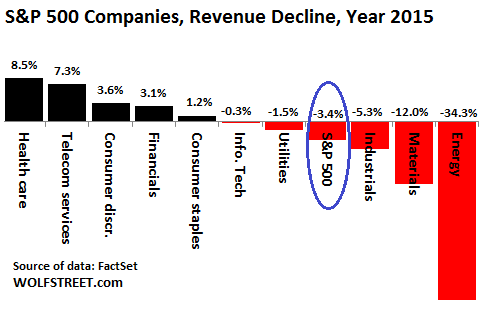 If the Energy sector were excluded from the revenue picture, the blended revenue growth rate for the S&P 500 would rise to a measly 0.9% from -3.5%. If the huge Health Care sector were excluded, revenues would plunge more deeply into the red. Earnings per share look even worse. And this despite the all-out efforts to financially engineer the results into better shape via share buybacks, which reduce the number of outstanding shares and thus increase the earnings per share. 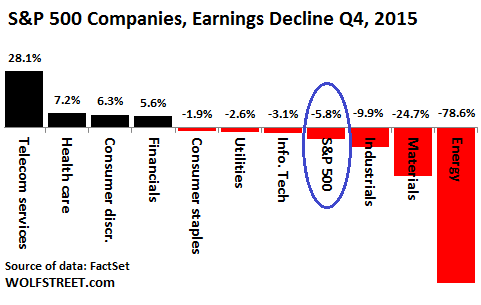 On a blended basis, according to FactSet, earnings per share in Q4 fell 5.8%. A month ago, Wall Street soothsayers had still estimated that earnings per share would fall “only” 5.0%. But as reality trickled in, they lowered their estimates. If the remaining earnings season pans out similarly, EPS will have declined three quarters in a row for the first time since Q1 2009 through Q3 2009. If the Energy sector were excluded, earnings per share would have edged up a measly 0.5%. If the Health Care sector were excluded, earnings would have plunged into perdition. Funny things happen when you remove some inconvenient elements from the calculus. 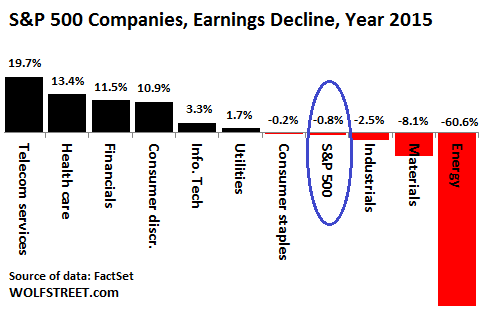 So how are earnings going to look in 2016? Wall Street soothsayers are convinced: a heck of a lot better. Back on December 31, they still figured revenues would grow 4.3% in CY 2016. By Friday, they’d chopped their estimates to a growth of 2.7%, as they’re adjusting to a somber reality heading their way. And they pegged earnings growth at 5.0%, down from 7.6% on December 31. And how are earnings going to look in 2017? Hurrah, double-digit earnings growth is back! Double-digit earnings growth in the distant future is the rule. It serves the exclusive purpose of justifying high-flying stock prices in the presence. According to our soothsayers, earnings per share in 2017 are going to soar 13.2% on a 6.1% revenue increase. But reality is now. And now revenues and earnings are declining. The only way to keep earnings from falling off the cliff in this environment is for companies to dive head-first into cost cutting. Many have already started that process. Their announcements, including layoffs, are hitting the headlines on a daily basis. Corporate cost-cutting creates a secondary effect. By slashing costs and capital expenditures, companies are slashing the revenues of their suppliers and incomes of current or laid-off employees. These suppliers in turn start slashing their costs. And people who’d just been laid off as part of the cost-cutting strategies are going to watch more carefully what they spend, which dings consumer spending. And it’s via these cost-cutting measures ricocheting through corporate America that earnings and revenue recessions end up filtering unpleasantly into the overall economy. If interest rates on auto loans and home mortgages were raised to their historic averages, the whole economy would tank. What passes for an economy in the U.S., is all due to the Fed’s smoke and mirrors policies. It’s no wonder that the Fed will not allow itself to be independently audited. There is another aspect to this. Succesful cutting of expenses may support profits but also tends to shrink the scale of activities. Debt must be repaid from revenues however, and is harder to support if the top-line does not grow. Servicing the debt is one thing, rolling it over may become a real problem in the future. Who will want to buy new debt from companies with shrinking top-lines in a recessionary environment where other parties need to restructure their debts? Worse than who will want to buy the debt, more like how and where from..
My thinking is that as the debt balloon collapses, there won’t be much free cash in the market because as the revenues shrinks, so does the real asset value of which the value of the debt is based upon. How do you borrow more on a shrinking asset value? This isn’t China yet. I assume that this collapse should go like things aren’t different this time and companies and funds will be scrambling to sell anything and everything to raise cash to not only service existing debt and not go into default but to pay for continuing operations. Until the FED or the Treasury opens the hangers and sends out the helicopters (starts transferring money into our bank accounts), that CASH will be King… for a while any way. And investors still put their money into such companies, but only because it might be better than sitting on cash. At least for a while. Corporate governance in the U.S. is bizarre. All the borrowed money and financial engineering will land up in management’s pocket. They don’t care if the company implodes as long as they can walk away with as much as they can get. If you are buying the stock of a company participating in a buyback program, you are either an idiot or a speculator, but not an investor. Easiest financial engineering to pull off is the RIF (reduction in force) which very negatively impact so many lives/families. Then the company goes out to borrow more money or use the “cost savings” from RIF to buy back “depressed” shares in hopes of making or more like financial engineering the earnings. To this add non-GAAP and mark to market accounting not to mention guiding the ANALysts #s down thru out the quarter to “beat” the earnings shell game with the banksters all hyping the “beat”. And the HFT algos which has taken over the majority of trading has NO clue on GAAP vs non-GAAP and other important #s or fundamentals focusing just on the technicals. This market built on deck of cards will crash down once HFT algos programmed to market going up goes hay-wire on dead cat bounces and downward trend to bear market territory. If you are expecting revenue growth from investments in any big company, forget it. Last week I splurged on an impulse buy, $18 for an item originally priced at $48. In the old days I would have paid full price because it was a good quality item, these days I can’t. I will tell you that I stopped and thought about whether I could afford the $18. This is the real state of the economy. Based on what I see on the ground, corporate profits will decline because they have no pricing power. If the item is expensive I have to walk away. There is no wiggle room anymore. The CEO of IKEA said it best – that people have too much “stuff” and are not buying as much stuff. So the consumer spending engine is stalling over-shadowed and more like hidden by sky rocketing health care cost under consumer spend category. Malls are closing not to mention dept and other national chain and mom & pop shops. Heck even the national chain restaurants are closing where I live in SF bay area due to high rent. Anyone have any good links to or information about commercial real estate values? It seems to me there has been so much built and the consumer is not buying as much.. just seems that there should be signs of weakness in this sector. How can all these malls, shopping centers and strip malls be providing the income to service the debts incurred and still make the owners a profit? A lot of those malls are owned by pension funds, Banks which use them as collateral and overvalued asset on book. Or for tax purposes. Some of them are also green-card anchors. And Laundry services. Gangsters have laundered Billion through commercial property deals. Then back financed the property to get Legit cash out. I know of one that has good occupancy but never makes real money. The owners have being trying to sell it for over 15 years. They haven’t been forced into a situation where they have to dump it, YET. Watch what happens, as they start getting shuttered. Untill that time they are still providing a “service” to their owner, somehow. Also how many of them are owned by Munis??? Take away hundreds of thousends of lay offs for the last 7 years by companies like IBM, HP,MSFT, SEARS, etc,etc. They actually made 0 profit! All they did is cut overhead and buy back shares. Yes but this hide the weenie can go so far as lay offs are 1 time event (other financial engineering to boot) and unless the companies can continue to borrow to buy back shares in perpetuity (with rising borrow cost and earthquakes in junk bond market) – the house built on deck of cards are about to fall down. I hear ya Vespa I hear ya. Yep many of knew the buybacks were shams! PS – 2nd page of the link talks about phantom buybacks and squancering away the opportunity (lack of) cost. The Deflationary Death Spiral is underway. Microsoft gets a lot of its revenue and profits from B2B sales. I would assume their enterprise customers consider purchases of most Microsoft products as capital expenditures. So IT refresh projects are probably being pushed to enable more cash to be plowed into stock buybacks. GOOG and Fakebook both had gangbuster Q4 but I think there is limited $$$ for online ads and many small biz (including my plastic surgeon friend – once GOOG ad fan) are finding that return on ads are not as good as the old days and IF companies small and big face downturn in business then there will be less $$$ for online ads. This also impact so many of the wanna be Unicorns in time wasting social media world. BTW – I think next Nas meltdown will come from dying unicorns and the market turning its back on so tiring social media hooplas. I’m no expert, but it sounds like a bad time is headed our way. Is it really going to be that bad? Death spiral? Dead unicorns?